The tutorial explains the syntax of the Google Sheets VLOOKUP function and shows how to use Vlookup formulas for solving real-life tasks. When working with interrelated data, one of the most common challenges is finding information across multiple sheets. You often perform such tasks in everyday life, for example when scanning a flight schedule board for your flight number to get the departing time and status. 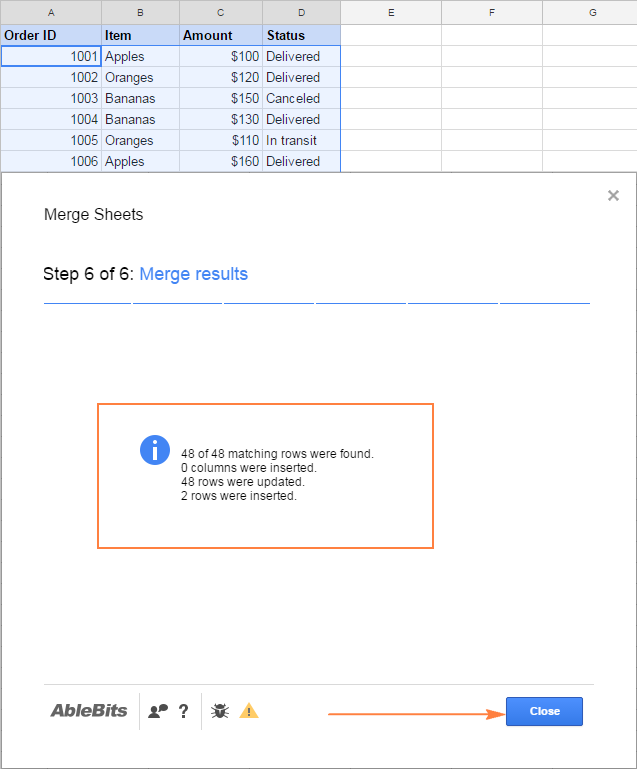 Google Sheets VLOOKUP works in a similar way - looks up and retrieves matching data from another table on the same sheet or from a different sheet. A widespread opinion is that VLOOKUP is one of the most difficult and obscure functions. But that's not true! 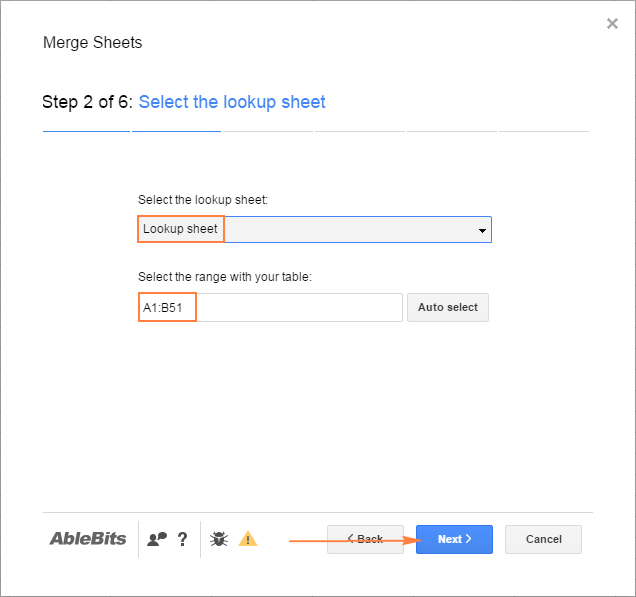 In fact, it's easy to do VLOOKUP in Google Sheets, and in a moment you will make sure of it. The VLOOKUP function in Google Sheets is designed to perform a vertical lookup - search for a key value (unique identifier) down the first column in a specified range and return a value in the same row from another column. Search_key - is the value to search for (lookup value or unique identifier). For example, you can search for the word "apple", number 10, or the value in cell A2. Range - two or more columns of data for the search. The Google Sheets VLOOKUP function always searches in the first column of range. Index - the column number in range from which a matching value (value in the same row as search_key) should be returned. The first column in range has index 1. If index is less than 1, a Vlookup formula returns the #VALUE! error. If it's greater than the number of columns in range, VLOOKUP returns the #REF! error. Is_sorted - indicates whether your Vlookup formula should return the nearest match (TRUE) or exact match (FALSE). If is_sorted is set to FALSE, the Vlookup formula searches with exact match. If the lookup column (the first column of range) contains 2 or more values exactly equal to search_key, the 1st value found is returned. If an exact match is not found, the #N/A error is returned. In most cases, it's recommended to Vlookup with exact match. If is_sorted is TRUE or omitted (default), a Vlookup formula returns an approximate match. The lookup column must be sorted in ascending order, i.e. from A to Z or from smallest to largest. Vlookup with approximate match works this way: the formula searches for the exact match first. If the exact match is not found, it searches for the closest match that is less than or equal to search_key. If all values in the lookup column are greater than the search key, the #N/A error is returned. At first sight, the syntax may seem a bit complicated, but the below Google Sheet Vlookup formula example will make things easier to understand. Supposing you have two tables: main table and lookup table like shown in the screenshot below. The tables have a common column (Order ID) that is a unique identifier. You aim to pull the status of each order from the lookup table to the main table. Search_key - Order ID (A3), the value to be searched for in the first column of the Lookup table. Range - the Lookup table ($F$3:$G$8). Please pay attention that we lock the range by using absolute cell references since we plan to copy the formula to multiple cells. Index - 2 because the Status column from which we want to return a match is the 2nd column in range. Is_sorted - FALSE because our search column (F) is not sorted. As you already understood, the Google Sheets VLOOKUP function is a thing with nuances. Remembering these five simple facts will keep you out of trouble and help you avoid most common Vlookup errors. Google Sheets VLOOKUP cannot look at its left, it always searches in the first (leftmost) column of the range. To do a left Vlookup, use Google Sheets Index Match formula. Vlookup in Google Sheets is case-insensitive, meaning it does not distinguish lowercase and uppercase characters. For case-sensitive lookup, use this formula. If VLOOKUP returns incorrect results, set the is_sorted argument to FALSE to return exact matches. When is_sorted set to TRUE or omitted (Vlookup with the closest match), remember to sort the first column of range in ascending order. Google Sheets VLOOKUP can search with partial match based on the wildcard characters: the question mark (?) and asterisk (*). Please see this Vlookup formula example for more details. 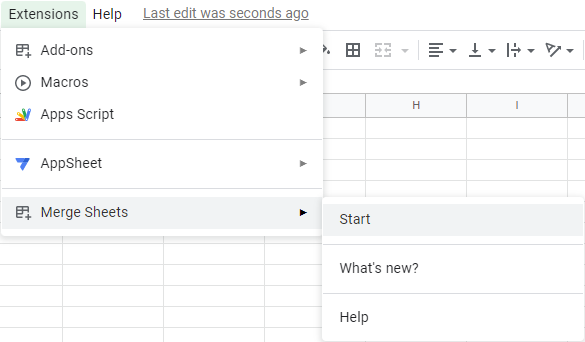 Now that you have a basic idea of how Google Sheets Vlookup works, it's time to try your hand in making a few formulas on your own. To make the below Vlookup examples easier to follow, you can open the sample Vlookup Google sheet. The formula will search for the value in A2 in the range A2:A7 on Sheet4, and return a matching value from column B (2nd column in range). Tip. 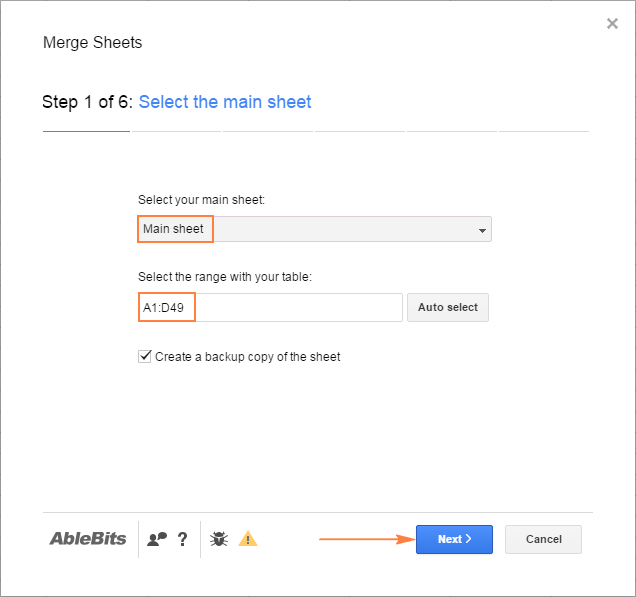 Instead of typing a reference to another sheet manually, you can have Google Sheets insert it for you automatically. For this, start typing your Vlookup formula and when it comes to the range argument, switch to the lookup sheet and select the range using a mouse. This will add a range reference to the formula, and you will only have to change a relative reference (default) to an absolute reference. To do this, either type the $ sign before the column letter and row number, or select the reference and press F4 to toggle between different reference types. Asterisk (*) to match any sequence of characters. Tip. If you need to search for an actual question mark or asterisk character, put a tilde (~) before the character, e.g. "~*". Another advantage of the Index Match formula compared to Vlookup is that it is immune to structural changes you make in the sheets since it references the return column directly. In particular, inserting or deleting a column in the lookup table breaks a Vlookup formula because the "hard-coded" index number becomes invalid, while the Index Match formula remains safe and sound. For more information about INDEX MATCH, please see Why INDEX & MATCH is a better alternative to VLOOKUP. Though the above tutorial targets Excel, INDEX MATCH in Google Sheets works exactly the same way, except for different names of the arguments. Tip. Pressing Ctrl + Shift + Enter while editing a formula inserts the ARRAYFORMULA function at the beginning of the formula automatically. Vlookup formulas are the most common, but not the only, way to look up in Google Sheets. The next and the final section of this tutorial demonstrates an alternative. If you are looking for a visual formula-free way to do Google spreadsheet Vlookup, consider using the Merge Sheets add-on. You can get it for free from the Google Sheets add-ons store. 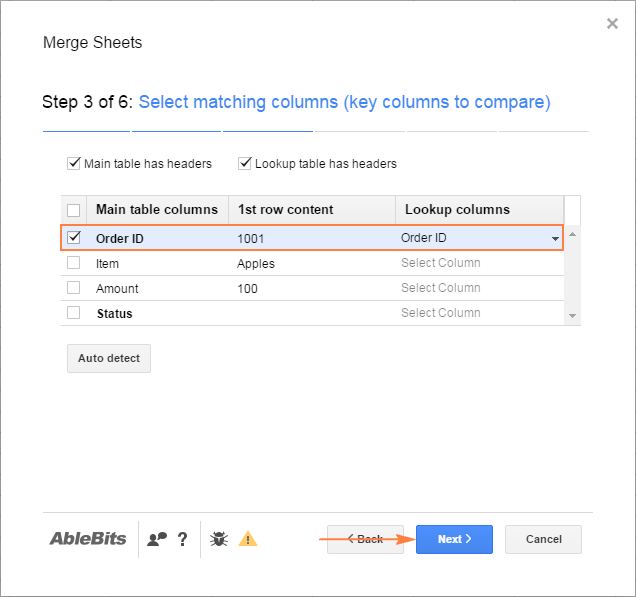 Select any cell with data within the Main sheet and click Add-ons > Marge Sheets > Start. Select the range in the Lookup sheet. The range does not necessarily have to be the same size as the range in the main sheet. In this example, the lookup table has 2 more rows than the main table. Under Lookup columns, select the column(s) in the Lookup sheet from which you want to retrieve data. Under Main columns, choose the corresponding columns in the Main sheet into which you want to copy the data. 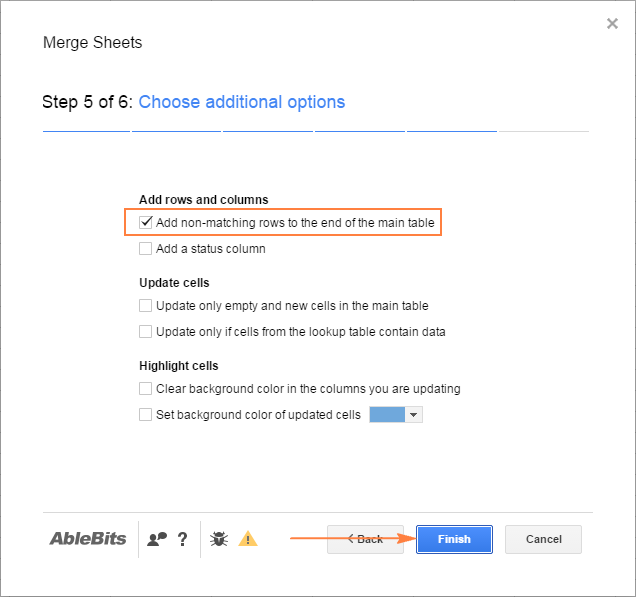 Click Finish, allow the Merge Sheets add-on a moment for processing, and you are good to go! That's how you can do Google Sheets lookup. I thank you for reading and hope to see you on our blog next week! Excel VLOOKUP formula examples - two-way lookup, nested vlookup with multiple criteria, and more. Excel Vlookup with Sum and Sumif - formula examples to look up and sum matching values. 15 Responses to "Google Sheets VLOOKUP with examples"
Now, can I do the vlookup to a different spreadsheet? And if so, how do I reference it? 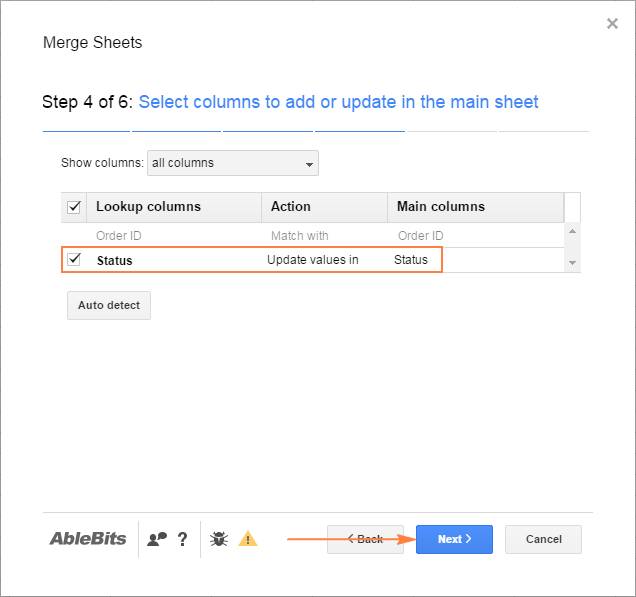 Thank you for sharing this tip, it could be the answer to one of the biggest problems I have and it should help me get around the Cell maximums that Google Sheets imposes on my spreadsheets. VLOOKUP evaluates to an out of bounds range. I am wondering, are there limits to the size of the lookup range if i use IMPORTRANGE within a VLOOKUP? Thank you for this post!! Super helpful!! I have a google sheet for hiring part-time staff. The sheet has 2 tabs - one for hiring students and one for hiring not-students. The column headings in both tabs are the same, but do not appear in the same columns. So I have columns A, B, C equal to status, first name, last name in both tabs. But for hire date, hourly rate, etc. they might appear in Column E in one tab and Column R in the other. And what I want to do is create a master sheet with all the information for both tabs. Could you please specify what remains unclear? If you'd like, you can check the article about VLOOKUP in Excel, they work the same. How to get the answer from sheet2 when look up value is in sheet1. Oh, my God, thank you! I finally got it to work because of your explanation. My project is back on track and off to the races! Thank you, this is great! I'm having trouble with copying the formula all the way down the sheet though - I have approx 1000 rows and need the lookup to go row-by-row to check the whole range. But when I copy the formula by dragging the crosshair down the sheet, the formula automatically changes the lookup range to start looking up in the matching row in the lookup sheet (so instead of searching A2:F1001, it will change to A3:F1002 then A4:F1003, and so on all the way down). How do I keep it so that the lookup range stays the same, but the search_key changes for each row number?? Just lock the lookup range by using absolute cell references ($A$2:$F$1001) and it will stay the same when you copy the formula. How to move the lookup range automaticaly to include new data after input in Google Sheet? Can the Table function applied in Google Sheet?